Majority ownership of Eastridge Mall is moving from General Growth Properties to Pacific Retail Partners and Silverpeak Real Estate Partners. 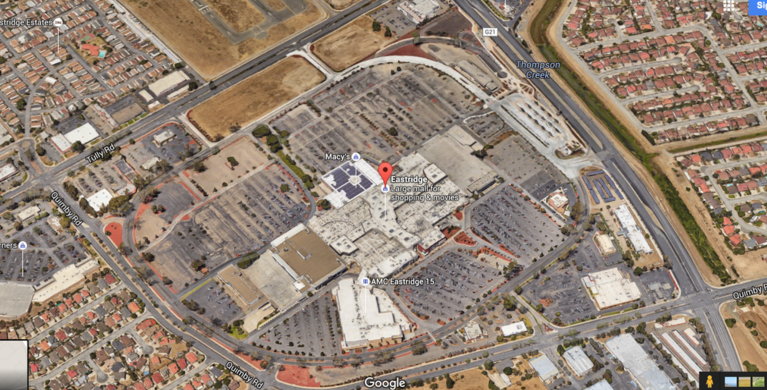 While those names likely don't mean much to you, the new owners are planning to revitalize the 1.4 million SQFT mall. They will be investing $15 million off the bat and have already announced that H&M is going to be one of the new tenants. The popular clothing store is going to take a 23,000 SQFT space in Eastridge, roughly the same size as the Santana Row location. You can also expect new paint, landscaping, signage and a revamped play area and food court. In the SVBJ article, there is mention of bringing in an Asian grocer. I can see something like a 99 Ranch Market doing very well here. The last Eastridge renovation was in 2007 and included a $140 million expansion. Currently the mall is 97.3% leased, which is a very strong number given that retail is slowly trending away from malls. The purchase also includes tons of developable land circling the mall. I'm sure that building on that extra property will only become more lucrative after the Bus Rapid Transit system running from Downtown San Jose to Eastridge is completed at the end of this year.